Russian gas monopoly Gazprom says it will cut gas supplies to neighbouring Ukraine unless a $1.3bn (£650m) bill is paid this month. Previous disputes between Russia and Ukraine over gas supplies have led to cuts in gas deliveries to Europe. Gazprom said Ukraine had taken no action despite repeated requests and warned it would be forced to decrease deliveries if the debt was not settled. The European Commission called for a "speedy solution" to the dispute. 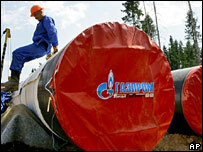 State-controlled Gazprom said it had informed European clients. Gazprom's threat comes two days after parliamentary elections in Ukraine. No clear winner has emerged as rival parties claim victory. "Bearing in mind the approaching winter season and higher demand for gas, as well as the Ukrainian repeated failures to fulfil gas contracts, Gazprom will have to reduce gas deliveries to Ukrainian consumers if the debt is not settled in October," the company said. In August, Gazprom said it would halve supplies to Belarus because of a $500m debt after Minsk failed to pay in full for previous shipments. The Russian firm later postponed the deadline for Belarus to repay the debt after a first instalment was paid. Like Belarus, Ukraine was forced to start paying more for its Russian gas in 2006, but not before Gazprom reduced its supplies, leading to a knock-on reduction in gas passing through the country to western Europe. This dispute sparked concern within European Union nations about their energy security and the future reliably of Russian gas, which now accounts for much of European requirements. Moscow denies accusations that it uses gas supplies to bully its neighbours. Instead, it insists that price rises last year for Belarus, Ukraine and Georgia merely reflect the end of Soviet-era subsidies.